Every February 14, across the world, people exchange candy, flowers, and gifts all in the name of St. Valentine. But who was Saint Valentine, and how did he become associated with this ancient rite? The history of Valentine’s Day–and the story of its patron saint–is shrouded in mystery. We do know that February has long been celebrated as a month of romance and that St. Valentine’s Day, as we know it today, contains vestiges of both Christian and ancient Roman tradition. According to one legend, the holiday celebration of the Priest Valentine, who served in third century Rome. When Emperor Claudius II outlawed marriage for young men because he decided that single men made better soldiers. Than those with wives and families, Valentine, realizing the injustice of the decree, defied the Emperor and continued to perform marriages for young lovers in secret. When Claudius discovered the treachery, Priest Valentine was put to death. According to another legend, an imprisoned Valentine actually sent the first “valentine” greeting himself after he fell in love with a young girl. Before his death, it is alleged that he wrote her a letter signed “From your Valentine,” an expression that is still in use today. Although the truth behind the Valentine legends is murky, the stories all emphasize his appeal as a sympathetic, heroic and–most importantly–romantic figure. Valentines Day didn’t come to resemble the modern day of love until the Middle Ages when the holiday began to definitively celebrate romance. VDay greetings became popular during this period, but written messages didn’t surface until after 1400. The first Valentine’s Day card ever is believed to have been written in 1415 by Charles, Duke of Orleans, who was imprisoned in the Tower of London. He wrote a message of love to his wife after his capture at the Battle of Agincourt. By the middle of the 18th, it was common for friends and lovers of all social classes to exchange small tokens of affection or handwritten notes, and by 1900 printed cards began to replace written letters due to improvements in printing technology. Ready-made cards were an easy way for people to express their emotions in a time when direct expression of one’s feelings was discouraged. Cheaper postage rates also contributed to an increase in the popularity of sending Valentine’s Day greetings. Today, approximately 150 million Valentine’s Day cards are exchanged annually, making Valentine’s Day the second most popular card-sending holiday after Christmas. Today the traditions of Valentine’s Day are observed all over the world. 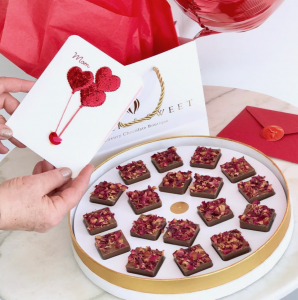 Valentine’s Day cards and gifts such as flowers, chocolates or jewelry convey love messages, and many choose to share a romantic Valentine’s activity to celebrate their love. Long associated with lovers, Valentine’s Day is also a popular day for marriage proposals and weddings. Many choose to follow a traditional Valentine’s theme by celebrating at a romantic location and incorporating poetry and music reflective of their personal story. Whatever the Valentine’s Day celebration planned, featuring well-known symbols helps to create a romantic atmosphere. The red rose is a traditional symbol of love and passion and has appeared in paintings, poetry, and songs for hundreds of years. Sending a single red rose on Valentine’s Day is usually understood to mean ‘I love you’. Heart shapes are featured on wrapping paper and gift boxes and are often used for special cookies or cakes. 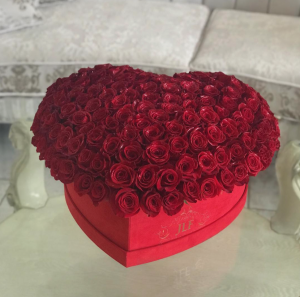 Red and pink flowers with love messages are a popular Valentine’s Day gift and red roses are usually considered the most romantic. Celebrate Valentine’s Day the Best Way – The J’Adore Way! Regardless of how far in advance you’ve planned out your Valentine’s Day gift, luxurious flowers are always a must on this most romantic day of the year. 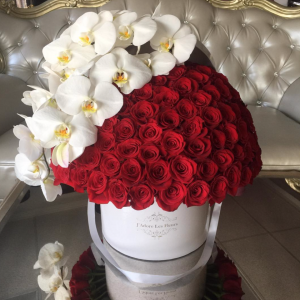 At J’Adore Les Fleurs we have every arrangement you need to express your love. Whether you are looking for a local flower shop to order a fresh flower arrangement from. You are looking to surprise your long-distance love with some preserved roses. Our flower delivery service will hand-deliver your flowers or ship them right to your door just in time for February 14. Browse through JLF Valentine’s Day Collection to shop for the perfect Valentine’s Day fresh flowers or through JLF Everlasting Rose Collection to find the perfect Everlasting Roses that last a whole year, to leave a longer-lasting impression on your sweetheart.